Electrochemically Enabled Sustainability: Devices, Materials and Mechanisms for Energy Conversion covers topics related to current research in electrochemical power sources, highlighting some of the latest concepts in electrochemical conversion for sustainability. The book examines the most recent and innovative technologies employed in battery and fuel cell technology. It introduces the fundamental concepts applied to these electrochemical power sources and provides in-depth discussion on the materials, design, and performance of these devices. 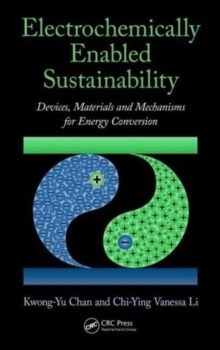 Written by internationally acclaimed experts, the chapters illustrate how key technologies for sustainability are enabled by electrochemical conversion. Topics include the reduction of carbon dioxide to resolve issues of carbon capture, energy storage, and generation of portable fuel; turning waste into energy using microbial fuel cells; the promise of vanadium redox flow batteries for massive energy storage; and improved performance of hybrid devices. The book addresses numerous aspects of lithium-type batteries for vehicle propulsion and energy storage, presenting a broad range of lithium batteries, and considering nano-structuring issues, layered-structure materials, and hierarchical structure. This book provides timely coverage of critical issues in emerging and conventional technologies, presenting a wide range of electrochemical devices, related materials, and operation mechanisms. It stimulates an appreciation for the novelty of these electrochemical power sources and offers a projection of future integration of these devices in practice.